Mother Mary appeared with the Archangel Rafael in a splendorous light at the ‘grotto’ at the house of the Visionary, in the 3rd Glorious Mystery, the 8th Hail Mary and She has remained for 9min. Receive a blessing that comes profoundly from My heart for every one of you. Don’t let anyone break you for coming closer to Me and to My Son Jesus. Hold tight to your faith so you won’t ever fall into temptation and sin. My Son Jesus forgives all those who are burdened with a lot of sins from their past. If they come with an open heart, they will be forgiven and free to start a new life. Don’t be afraid of anything. Keep on praying and making efforts for your sacrifices, even though others might make fun of the Holy Rosary and the Bible. Don’t step back but come closer than ever to My Son Jesus. Those who fall, rise and keep on going forward. Pray your Holy Rosary every day. The love of My Son Jesus is greater than ever for you. I, your Mother, have always got love for you. Remember to pray at all moments and if you get the opportunity go to Mass every day. If you got time go to adoration at the Holy Sacrament during the week. You must go to adoration, because many of you go to Purgatory each day. The world has many great and difficult problems, that is why you should pray more. I give you Peace, love and a lot of blessings, My children. Stay away from all enemies, remain with the blessing and the light but keep on praying and loving them. Be sincere and humble so you can reach victory one day. You all are on a test every day. My children pray for the Priests and the Bishops, because many of them are being dominates and tempted by evil. Let the Holy Spirit protect all the Priests and Bishops so they can receive strength to keep on working for the Catholic Church with a lot of love. Let the mercy of My Son Jesus remain with and with this world. I don’t want to say goodbye, I want you to know more about Me. I will pray for all who don’t believe to get the opportunity to believe one day. That will become the greatest miracle of your life, your conversion; to reach the truth, to reach Me and My Son Jesus. 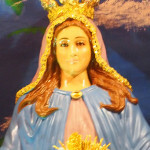 Your Mother, the Virgin of Grace of Aruba, who will shine in your hearts with a lot of joy and who will have your dreams come true.